The only brand in Singapore so far is CareFresh. It is made from wood pulp fibre & is said to be sanitised to kill bacteria, mold & fungus. Its also said to have no added inks or dyes. Some have said that it gets wet easily & becomes mushy. If this is true, it could be due to the humid weather here which causes it to dry much slower. Some have also said that clean up is messy 'cos when wet it become mushy & tends to stick together. The largest bag of CareFresh is 50 litres/16.6 kg which costs $36 at Pet Essentials. There is another bedding called CareFresh Ultra which is supposedly more dust free & is white in colour, but is costs more than CareFresh, which is already quite costly. CareFresh Ultra costs $42 for 30 litres/10kg at Petmart. Supposedly good at controlling odour. Supposedly good at moisture absorbancy. Most expensive of all bedding. I believe there is only one brand in Singapore and it is Pets Preference Soft Texture. It is made from recycled newspaper & looks like shredded CareFresh in the sense that it is extremely fine. Being so fine, I believe you might need quite a bit of it to fill the cage. I'm also worried whether the tiny particles can get inhaled. The largest bag is 30 litres (10 kg) & costs $25. Pet's Preference's distributor is Tri Alba Pet Products which you can contact at 6466 0462 or trialba@singnet.com.sg. I find the particles a bit too tiny. These are also made from recycled newspaper but they are compressed to form pellets. I believe there are three brands available. The first is Pets Preference Original Texture. The next one is Good Mews which is from the same manufacturer as Pets Preference. They told me that Good Mews is identical to Pets Preference except a mild non-toxic food grade "forest" fragrance is added to Good Mews. Don't worry about Good Mews being labelled as cat litter. 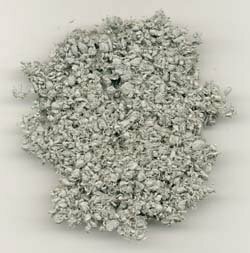 Unlike clay or silica based cat litter, cat litter made from recycled paper are safe for cavies. The third brand is Breeder's Choice Cat Litter which although labelled as cat litter, is also safe for cavies for the same reasons as above. It comes in 2 kg ($6.30), 5 kg ($13.30), 8 kg ($20.30) & 13.3 kg ($32.30) sizes. 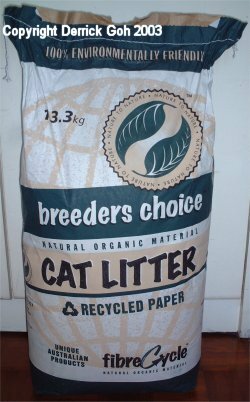 I am not sure how Good Mews & Pets Preference Original behaves, but I use Breeder's Choice so I can assure you the pellets do not crumble into powder when wet (unlike wood pellets). Instead it remains the same but become darker & a litte bit larger. 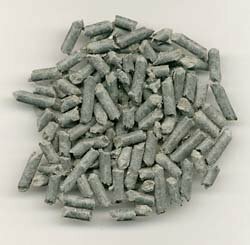 The picture below is of a Breeder's Choice pellet. Thanks to Justina from the S'pore Hamster Lovers Forum for snapping that photo for me. 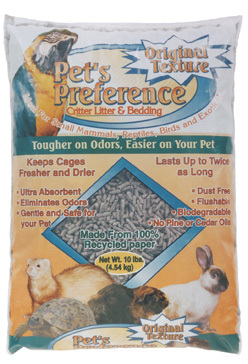 I feel Breeder's Choice is one of the best bedding & I highly recommend it!! It controls odours very well & absorb moisture so well that even though the bedding may appear wet, my cavies are actually dry. In fact my cavies are drier on Breeder's Choice than when they were on a wire bottom cage or plastic grid cage. More of that in my Housing sub-page. I tried squeezing a wet pellet (dark grey) & nothing dripped out. So that gives you an idea of how well it holds in the moisture. To save money, I do not throw out the wet bedding. Instead I spread it out & let it air & sun till its dry & odour-free. I then mix it with new bedding & pour the mixture back into the cage. This will help save cost & at the same time 'cos you're mixing it with new bedding, its not all re-used bedding. Here's what Breeder's Choice looks like. 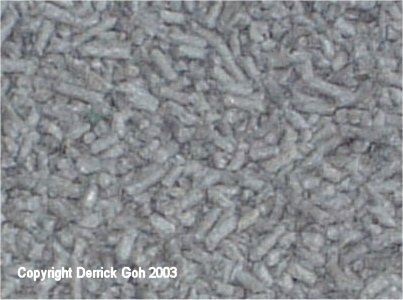 Recycled paper bedding pellets are much more comfortable than wood pellets. Wood pellets are very hard & tend to be sharp. Try pushing your fist into an opened bag of wood pellets & you'll know what I mean. Paper pellets however are softer. Once again, use your fist & you'd get what I mean! Thus I believe most cavies wouldn't find paper pellets uncomfortable. Pet's Preference's & Good Mew's distributor is Tri Alba Pet Products which you can contact at 6466 0462 or trialba@singnet.com.sg. Breeder's Choice distributor is Rein Biotech Services. Contact Mr Robin Siow at 6760 0767 or reincom3@singnet.com.sg. 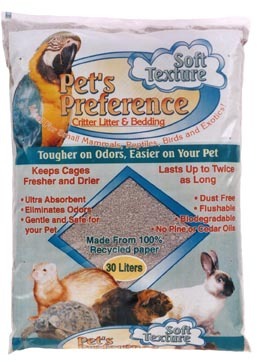 The picture below is of Pets Preference Original but as you can see it looks similar to Breeder's Choice & Good Mews. Less dusty than soft newspaper bedding. Soft, so most cavies should be quite comfortable with it.